WASHINGTON (CNS) — Secretary of State Mike Pompeo told religion reporters in a conference call late March 18 prior to his five-day visit to the Middle East that his visit was focusing on security, the economy, threats from Islamic radical terrorists and the need to promote religious tolerance. CNN, reporting March 19 on the exclusion of other media from this call, said that “despite repeated inquires and complaints from members of the press corps who are based at the department,” the State Department said it would not provide a transcript of the call or list media outlets that participated in it. Those objecting to the description say it could reflect a shift in U.S. policy, granting Israel more sovereignty over the region it captured from Syria during the 1967 Six-Day War. Israel later annexed that territory along with the West Bank, which many world leaders have denounced. 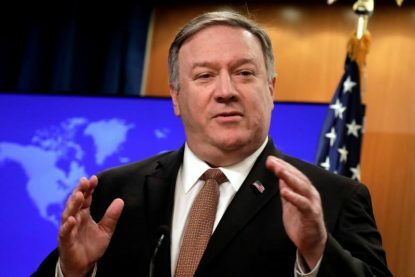 When asked why a group of evangelical leaders were recently invited to the White House to discuss a Middle East peace plan, Pompeo said he would leave that to the administration to explain but stressed that as an evangelical Christian himself, he said he understands the “centrality of that place” and that all Abrahamic traditions value Jerusalem. In 2017, in a move rejected by many world leaders, the United States recognized Jerusalem as the capital of Israel. The U.S. Embassy was moved from Tel Aviv to Jerusalem in the spring of 2018. When the announcement was first made of the U.S. decision on Jerusalem as the site for the embassy, Pope Francis expressed concern that it could further destabilize the Middle East. The Trump administration made the move based acted on a law passed by Congress in 1995 that provided for the embassy’s relocation, but Presidents Bill Clinton, George W. Bush and Barack Obama regularly signed waivers to postpone the relocation. The White House meeting in question took place March 7, according to Axios, a U.S. news website, when an evangelical group met with Middle East envoy Jason Greenblatt to discuss objections and concerns with the administration’s peace plan said to be unveiled in April. When asked about radical extremism, the secretary of state said no countries should “promote or permit” this, which he said the U.S. is focused on and will have to turn to other nations to do the same. He also was asked about U.S. policy toward Syria, even though he would not be visiting the war-torn region. Pompeo said the U.S. would continue to provide humanitarian relief but would not provide money for the country’s reconstruction until there was a “political resolution of this conflict” stressing there was no other way to move forward. He did not mention his meeting with Israeli Prime Minister Benjamin Netanyahu weeks before Israeli elections, which has been criticized as indicating support.